Hummingbirds, in general, are solitary and neither live nor migrate in flocks; and there is no pair bond for hummingbirds. The male's only involvement in the reproductive process is the actual mating with the female. Infant care has been observed to be a female's job, with males often being polygamous (mating with several females). The males do not participate in choosing the nest location, building the nest or raising the chicks. 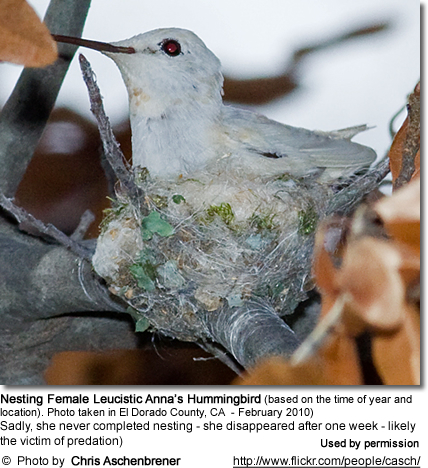 Nests are usually built in trees or shrubs. However, several tropical species attach their nests to the undersides of leaves. 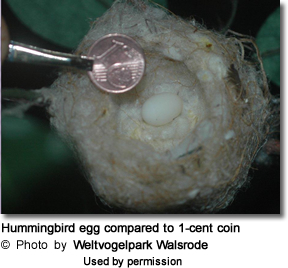 The nest size varies depending on the species - from smaller than half of a walnut shell up to 8 inches (20 cm) in diameter. The female will camouflage her nest by attaching mosses and lichens from the tree they are nesting in to make the nest virtually disappear. Eggs: Typically, two pea-sized plain white eggs are deposited in the nest cushioned with spider’s webs, butterfly cocoon’s and mosses. The nest is designed to expand as the babies grow larger through the use of spider silk in weaving. 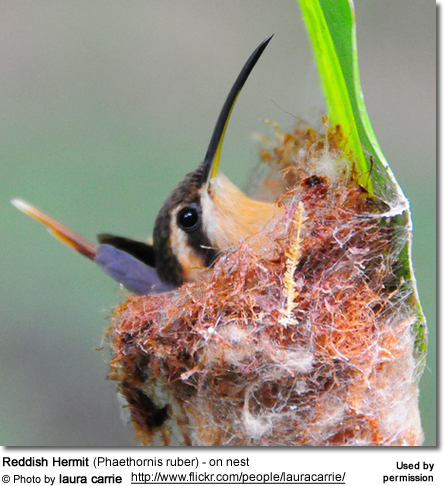 Even if two eggs are laid on different days, the young will hatch together in 14 - 23 days - depending on hummingbird species, ambient (environmental) temperature, and female attentiveness to the nest. 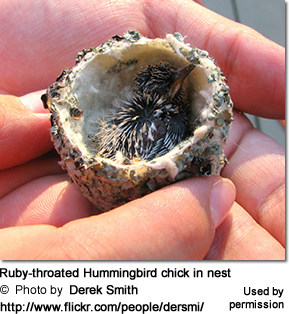 The smaller hummingbird species have shorter incubation periods than larger ones. During the night, hummingbirds generally become "torpid" - which basically means that their bodies go into a state of torpor (temporary or semi-hibernation) to conserve energy. 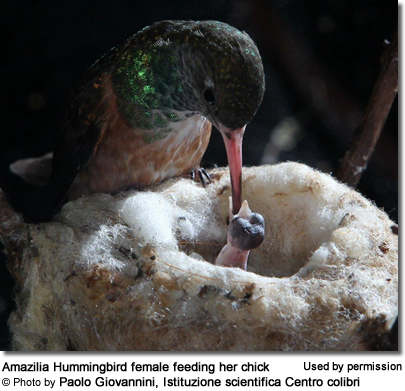 However, when incubating eggs, female hummingbirds do not enter torpidity because they need body heat to keep the eggs warm. The chicks hatch either featherless or only with very sparse feather down and have darkish skin. At this stage, they are blind and completely helpless. Their mother alone protects them and she must almost constantly help them stay warm until about nine days later when they are covered with tiny feathers. Then the chicks are left alone even on cooler nights - probably due to the fact that the small nest can't accommodate the growing chicks and the mother at the same time. The babies keep the nests clean instinctively by doing "their business" over the edge. The female feeds the young about every 20 minutes half-digested insects combined with nectar to supply them with the protein, amino acids and other nutrients necessary for growth and development. When feeding the young, she inserts her long, slim bill into the open mouth of a nestling and regurgitating the food into its crop. 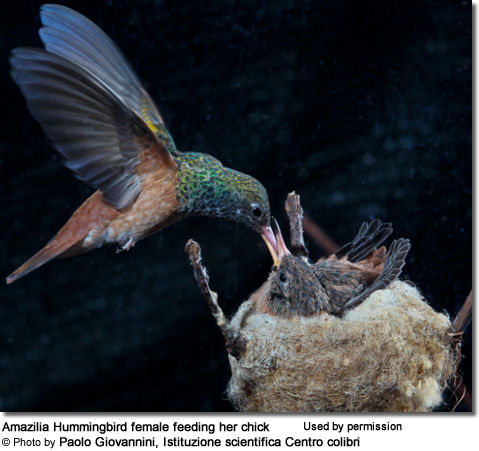 The hummingbird female will bravely defend her nest and her chicks from predators - even going as far as attacking large birds of prey, such as hawks, and humans. The chicks leave the nest (fledge) when they are about 20 days old. The mother continues to help them in their first few weeks after they leave the nest, directing them to choice hunting locations for bugs and for gathering nectar. 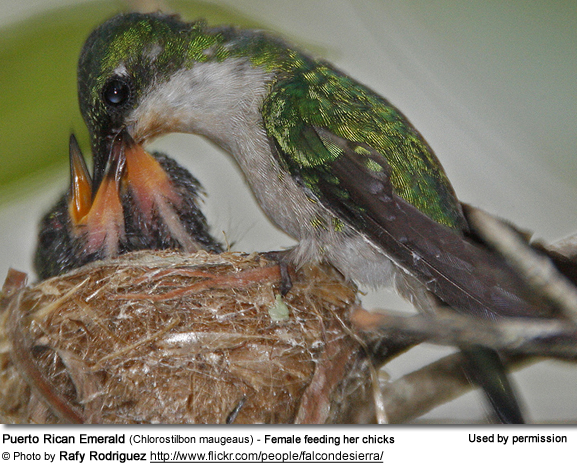 Some hummingbird mothers will also help orphaned hummingbird chicks. Hummingbird females usually only nest once, but occasionally twice per year - if conditions are favorable (plenty of food for her chicks and a safe nest site).